We also provide a modular motor concept for dynamic and precise servo applications. Choose the best servomotor for your application from three synchronous and one asynchronous series: compact, low-inertia and powerful. Many engine sizes and lengths guarantee a wide range of applications and deliver reliable standstill torques. What kinds of servomotor are available? A servomotor is a motor that lets you control the exact position of the motor shaft as well as the speed and/or acceleration. Corresponding sensors and regulation technology are also used for this purpose. Previously, servomotors were auxiliary drives that were designed for use in machine tools. Incidentally, the servomotor gets its name from the Latin word "servus," meaning "server" in English. Servomotors consist of either an asynchronous motor, a synchronous motor, or a DC motor. 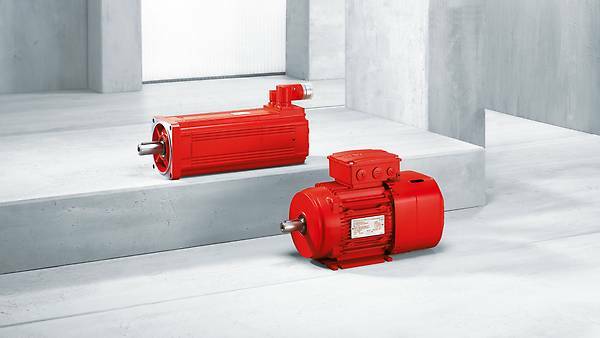 The difference between the motors is therefore not in the drive principle itself, but only in their regulation capabilities. Servomotors can be categorized into synchronous and asynchronous servomotors. However, the motor is always a drive that is operated with electronic positioning, speed, or torque control – or a combination of them. Very high requirements in terms of dynamics, setting ranges, and/or precision of movement are necessary for them. Servomotors are mostly used in combination with automation and control solutions, for instance, in packaging machines. Asynchronous servomotors are suitable for use in applications in which high external inertias have to be moved in plants and machines and controlled safely. With that in mind, the SEW‑EURODRIVE DRL. motor seriesprovides suitable drive solutions. Synchronous servomotors are drives in which the rotor is driven synchronously by the rotating field in the stator using the applied permanent magnets. A synchronous motor has a movement that is synchronous with the applied rotating field frequency. This drive design is operated on a frequency inverter that provides the appropriate controlled three-phase current. The SEW‑EURODRIVE portfolio includes a number of different designs for this purpose. The optimized CMP..-series servomotors can be adapted to high dynamics or high loads depending on the application. Classic application areas include the food and luxury goods industries and the construction, automotive, packaging, and woodworking industries. For CM..-series synchronous servomotorsthe emphasis is on optimum control characteristics, torque strengths, and dynamics. Ideal application areas for these motors can be found in logistics, for instance, as drives for X-Y-Z portals or storage/retrieval systems.